In the previous chapter we learned how to format and print our output. Now that we are familiar with the printf() function we will move a step ahead. Those who have not mastered the printf() function please refer the previous chapter before continuing. So what is a variable? Consider the following sentence: There are 40 students in my class. From this sentence we can say that there are exactly 40 students in the class. Now consider this statement: There are 'x' students in the class. The value of 'x' here can be any whole number(1,2,3... etc). We use variables in our programs to store data and the values of these variables can be changed at any time. Consider the following table. For different values of x we can print the same sentence, with the changing values. How are Data Types related with Variables? As x is a variable it can also store names, decimals and integers right. There were 15 passengers in the bus. There were 65.5 passengers in the bus. This has no meaning. Hence the data stored in the variable must be of a particular type. Therefore every time we create a variable we define the type of data that can be stored in the variable. Dont worry about the names, you will get used to them. We need to understand what each type means. Examples will clear all your doubts. They first column stands for the Data Type. The second column stands for the meaning and the third one for the range of values. The basic types are int , float and char , the remaining are rarely used and can be dealt with later on. 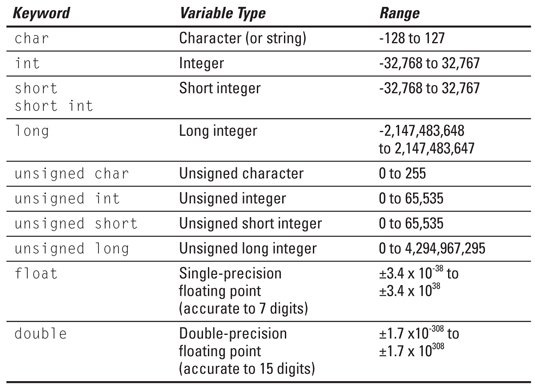 But why do all the Data Types have a range ? As we know variables store information, and all the information stored in the computer requires memory. But we also know that our computer has limited memory. As the size of information increases more memory is required. So we need to put a restriction on the size of information/data stored in the variable. Hence every data type has a fixed size and fixed range. Example: 1, 2, 0, -8, 5123, -8932, etc. Description: Used to store integer values. They can be negative, zero and positive. Example: 1.5621, 2.00, 0.435, -8.021, etc. Description: Used to store decimal values. They can be negative, zero and positive. Example: a, g, t, B, T, Z etc. Also 1, 2, 3 etc and symbols like +, %, # etc. But don't confuse these numbers with integers as we cannot apply any mathematical operations on them. It is just to print numbers. Description: Used to store a single Character. U might want to know how to store a name. I will answer it after some posts as it is an extension on Data Types and one needs to get familiar with these first before moving ahead. Finally u might be exhausted reading a post this long and hence there wont be any tutorial. I recommend the student to be fresh before learning something new and hence end this post here.